Do you remember when painter's tape was invented? For some reason, I do. I actually just googled it and ScotchBlue™ Painter’s Tape was invented in 1988 ... so maybe I don't remember it because I was three, but I do remember it getting popular. Leaking. This is from my chalkboard wall that I did recently. I still have rolls of blue tape lying around that I want to finish up so I used it for this project and my parent's front door makeover. Major leakage on both. 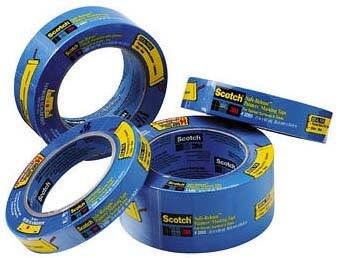 The point of this post: I am over ScotchBlue™ Painter’s Tape. 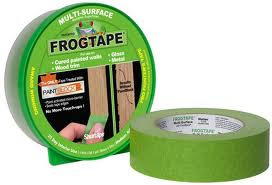 A lot of bloggers have written posts about their love for FrogTape (here, here). I was skeptical at first, but I thought I would give it a try since I've been having trouble with blue tape lately. I just recently used up the last of my blue tape and I'm happy to say that I am on the FrogTape bandwagon and I'm not going back. It is only a little more expensive than blue tape (about $.40) and it comes in a cool plastic case. 1) It is stickier. The point of painter's tape is that is sticky enough to stick to walls and trim without pulling paint or veneer off and to keep paint from leaking. Blue tape is just not sticky enough. Although, I recently helped a friend paint and the green tape did take off some of the veneer on their trim (nothing noticeable, it was just on the tape) so if you have fragile trim or paint you may want to got with the more gently blue tape but be warned: it leaks! 2) It doesn't leak. I've been trying to use green tape more for projects around my house and I am happy to say that it definitely doesn't leak as much as the blue tape. Although, it does have some (it's not perfect), but it is way less than the blue. 3) It's green and pretty.